Is Everything I Learned in Business School Completely Worthless? 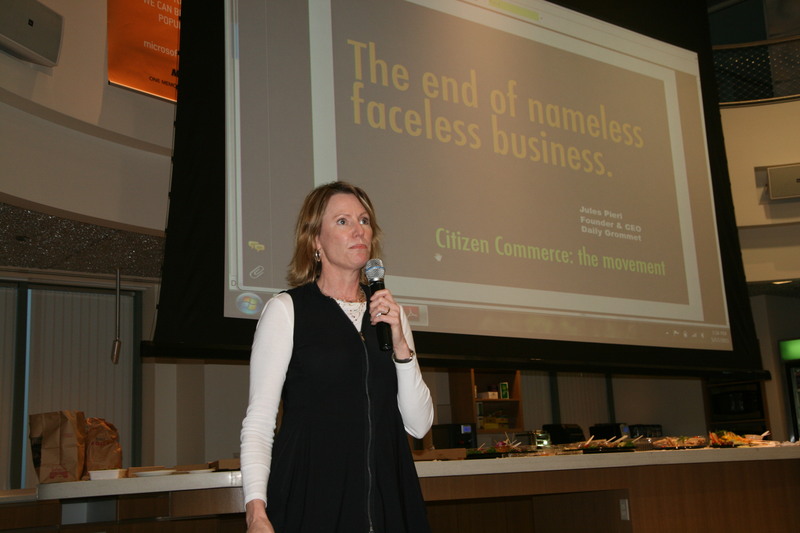 Last Tuesday my B-School (Michigan) alumni club hosted Jules Pieri, the founder of Daily Grommet and the birth mother of Citizen Commerce™. Jules is industrial-designer-turned-entrepreneur. She clearly has the gift of design which she uses to give name and form to sentiments and ideas. Even if you don’t know what Daily Grommet and Citizen Commerce are, you can sense that they stand for something fresh, honest, and good for you. That’s the promise of Citizen Commerce: to give consumers the power to choose products that are right for them in every way. Products that express and support who we are. Products that are, in a sense, “priceless” to our ability to do good and to our self-worth. It is this “priceless” aspect of Apple design and Whole Foods’ local organic produce that seems to defy every rule in my MBA coursebooks. Reduce the number of SKUs — Jules started Daily Grommet especially to give “shelf space” to unique specialty products that department stores refuse to carry. According to her, even P&G has trouble finding retailers for their experimental lines. Find a low-cost supplier — Most Daily Grommets are made in the US by people who love to make them, like the Alabama organic socks. The key is the inspired and even heroic character of the business and the people behind it. The price just is what it is. Design for a large market — Daily Grommet artists and inventors often create for themselves or their families to express a unique style or accomplish an unusual task. Hit the numbers — Daily Grommet is as much about the process as it is about the final result. Is the business environmentally friendly, socially responsible, health-conscious? Does it treat customers and employees well? Jules’ team will step in to market & scale up a product with the right “story”, rather than look for an easy money-maker. So, is the Boston alumni club membership the only worthwhile outcome of my $50,000-a-year MBA? Well, the strategy professor did say something about changing the game. Now I have met someone who showed me how. Thanks for your kind and thoughtful words and for coming to hear me speak. I loved how you framed your insights against “MBA rules” that you suggest might be broken to create something higher and better in the world. Let’s all do this together! Thanks, Jules! Of course, it’s not so much the rules, as the way we choose to apply them. But it feels good to be “radical” sometimes. There is no doubt that business schools present new challenges for their graduates. Like the challenge of getting a job.